Before you retired, when the idea of not going to work in the morning was a distant daydream, how did you imagine you’d spend your retirement years? Pushing the lawn mower back and forth? Waiting in line at the grocery store? No, of course not. Chances are, you’ve imagined a life with less stress and responsibility and more time to do the things you really love. In short, you imagined the type of lifestyle you can enjoy with independent living. The beauty of independent living is that it’s exactly like living at home but without the maintenance, making it the perfect way to downsize. What does “no maintenance” mean? It means you won’t have to mow your lawn or fix the bathroom faucet if it leaks, but other than that, your independent living apartment or cottage is yours. You can decorate it however you like, make your own meals, and do your own laundry, just like you do right now. And if you decide to go on a trip out of town? That’s fine. Independent living is a great option for anyone who plans on traveling a lot during their retirement because you won’t have to worry about getting someone to watch the house, turn on the sprinkler or collect the mail. You can lock your apartment door, hop in the car, and know that when you come back, everything will be just as clean and tidy as you left it. 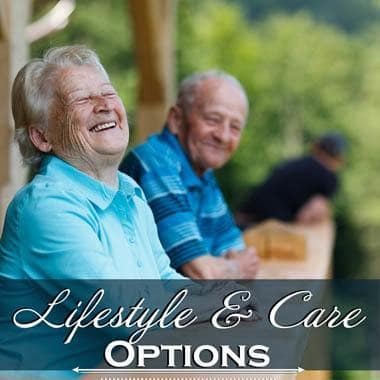 If you’re ready to leave the housework and worry behind and enjoy your retirement, browse our independent living options or use the button below to schedule a tour.